At the top of this little mountain with the same name there is a little church built between 1795-99. The floor design is slightly elliptical with a semicircular shape apse. 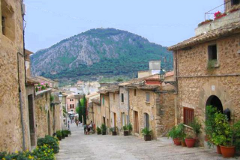 To arrive to the church there is a big staircase of 365 steps from where you can see a wonderful view over Pollensa. Inside the church there is a sculptured group of the crucified Christ with the Virgin at his feet, from the XIVth century. To get to the begining of the Calvary Steps, follow the signs to the Plaza Mayor (main square). 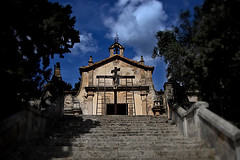 Then take a left behind the main church into what is known as Plaza Vieja, continue straight on until you see the start of the steps to your right.